A shelter made from a poncho, keep it low to the ground. 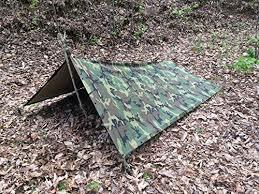 With all the recent rain we have been having, I have been thinking about field expedient shelters. Now I am familiar with many of the improvised shelters made with natural materials. But to tell you the truth I have never had much success at making a shelter out of brush, grass etc that would keep out a heavy rain. The best solution is to have something with you that you can use as a rain cover. This could be a sheet of plastic, a poncho, tarp or many other things. I recently purchased a number of brand new REI ground cloths that are designed to go under tents in a garage sale. They measure roughly 7X8 and are waterproof. They are lightweight weighting 14 ounces and have grommets in the corners. I am experimenting with using them for field expedient shelters and so far, they seem to be working well. This type of shelter works for sun, but is not a good rain shelter during heavy rains. Here are some different types of shelters that can be made with a poncho, ground cover, tarp or plastic sheet. Tarps or plastic sheeting can be used in a similar manner. If you are going to be in a location for some time you may want to build a brush or wood shelter and cover it with the waterproof items. This can give you a stronger shelter if you are dealing with wind or snow. In addition, you can get more insulation in cold weather. 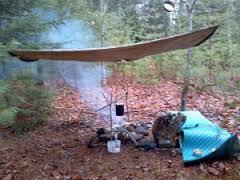 These types of field expedient shelters will keep you dry, but I prefer a tent if possible. If you have a location where you can store supplies, you may want to consider building something like the galaxy hut that has been showing up at Burning Man. Here is a link to a site that will show you all the details Galaxy Hut. This is one of the nicer setups I have seen. Field expedient shelters are something that you should learn how to build. Try them and you will see that they work. But if you plan ahead you may be able to build a much more comfortable shelter. This entry was posted in Shelter and tagged field expedient shelters. Bookmark the permalink. The old US Army poncho is fantastic and durable. They can be had for relatively little money if you look for them. 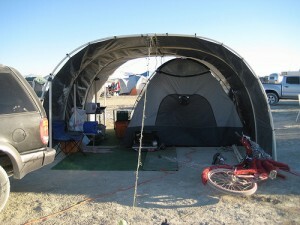 If you don’t mind spending more, a “siltarp” is fantastic and light. They are made by Integral Designs, and weigh next to nothing.